Every holiday we look forward to the abundance of different themes and delightful treats that come. Some stores start preparing months or weeks in advance before days like Thanksgiving or Christmas. Brightly colored candy, cookies, and gifts line row after row of the shelves. Valentine’s Day is no exception, as there are over thousands of candy and chocolate products sold leading up to this holiday. If you find yourself tired of the same old chocolate candy piece or heart-shaped sugar cookie then it may be time for a change this Valentine’s Day. Why not break the routine and hone your fancy cupcake baking skills while also making a dessert that will cause your friends to scratch their heads wondering just how you managed to make it. The fluffiness and sweetness won’t be the only thing grabbing your attention as you take a bite of these cupcakes. In the middle of these cupcakes, you will find a pink or red heart, a perfect way to show some love this Valentine’s Day. So grab your apron and see just how fun these cupcakes are to make- trust me, you are going to LOVE them! This recipe is adapted from the Sweet Tooth: Valentine’s Day Cupcakes post featured on Lauren Conrad’s website. After you have prepared the cake mix, pour half of the cake batter into another bowl. In this bowl, place the red food coloring drops. 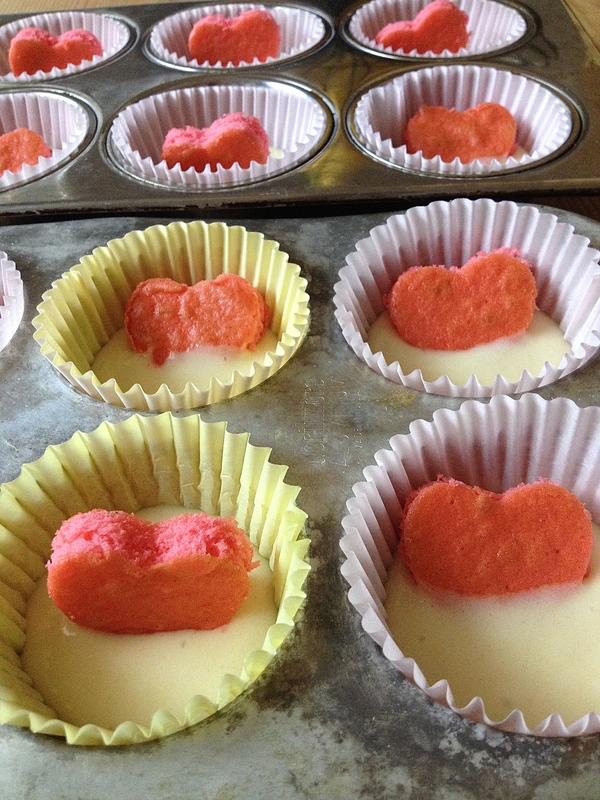 The amount of food coloring you add will influence the color of the baked hearts.I placed a few drops in the batter and our hearts turned out light pink. Once the batter is colored to your liking, pour the colored batter into a greased pan.I used the thin lid of another pan because the colored cake only needs to be about an inch thick. Place in the oven and bake for 15-20 minutes! As the colored batter is baking, start setting up your cupcake tins. Grab the other batter and place enough batter into each cupcake tin so that they are ¼ full. Set aside. Let the colored cake cool completely before you begin cutting the heart shapes. By letting the cake cool completely, you prevent the cake from crumbling or sticking to the cookie cutter or your fingers. Cut as many heart shapes as you want. Keep any “scraps” left of the colored cake after you have finished cutting the hearts out. These scraps can be used for making cake pops with any extra icing you have left! 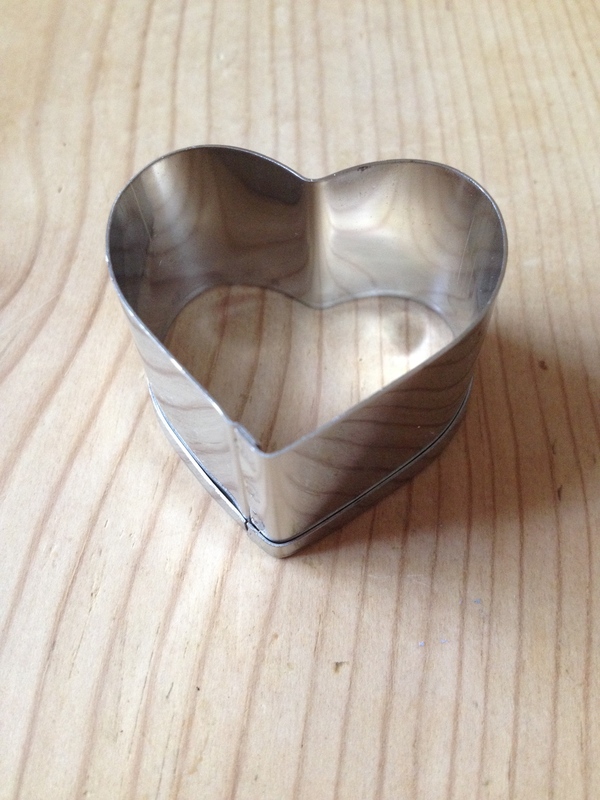 Place cut-out-hearts into the middle of the batter in each cupcake tin. If the hearts start to fall over, place more batter around the hearts to support them. Next, spoon some batter over the top and sides of the hearts to lightly cover them. *Note- Place all the hearts in the same direction so that after they are baked you will remember which way the heart is facing. Put in the oven and cook for 20 minutes. Remove from oven and let cool. Then frost away and share the love with others this Valentine’s Day. Don’t have time to make these before Valentine’s Day? Worry not! Use other food colors and cookie cutter shapes to make these cupcakes versatile throughout the year. Four-leaf clovers for St. Patty’s day? Rainbow star shapes for birthdays? Pumpkin shapes for Halloween? You decide! These cupcakes aren’t the healthiest food on the planet, but I still wanted to share this creative recipe…which can totally be adapted to be vegan, gluten free, sugar free etc.